There are 2 ferry routes operating between Mallorca and Ibiza offering you combined total of 42 sailings per week. Balearia operates 1 route, Palma to Ibiza which runs 4 times daily. Trasmediterranea operates 2 routes, Palma to Ibiza runs 7 times per week & Palma to Ibiza San Antonio about 7 times weekly. As the frequency and duration of crossings on some routes varies we would advise that you do a live search for crossings from Mallorca to Ibiza to get the most up to date information. Mallorca is the largest island of the Balearics found off the east coast of Spain. The island’s capital, La Palma is the heart of the archipelago, boasting a rich history, blossoming food scene and stunning architecture, most notably the namesake hilltop cathedral. Mallorca is also blessed with superb beaches to suit all types of holidaymaker, whether you’re into exciting water-sports or simply catching rays whilst immersed in a novel. The stunning coastline is well worth exploring too, particularly by bike, as the smooth, winding roads offer unbeatable sea views. Mallorca has two excellent ferry ports, one in the capital and the other in Alcudia on the northeast coast. With frequent routes to the other Balearic Islands and the Spanish mainland, Mallorca is a useful gateway to some of the country’s most popular holiday destinations. 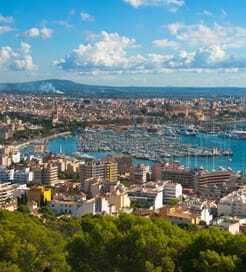 Ibiza is part of the Balearic Islands, an autonomous region of Spain sprawled along the mainland’s east coast in the Mediterranean Sea. Around six million revellers flock to Ibiza for its world famous clubs and epic beach parties every year, but its humble population, roughly one hundred and thirty thousand, is always keen to show off the island’s quieter side, encompassing beautiful backcountry, historic towns and secluded coves along the north coast. Outside the high-season, the Ibizan calendar brims with fun festivities like the Autumn Food Festival and various patron saint celebrations during winter, made even more enjoyable with the year-round, pleasant climate. If you’re on the east coast of Spain, travelling to Ibiza by ferry is the easiest way to get there, with frequent routes from big cities including Barcelona and Valencia. Sailing within the Balearics is easy, too, with a choice of crossings from Mallorca and Formentera.